chaired by Sandy Patterson 304-496-7345. -11:30 am. All photographers are welcome. For students entering 3rd grade to 2017 graduating seniors with a genuine interest in the arts. Camp is Monday-Friday 8:30 AM – 3:00 PM. fee includes hot breakfast and lunch and a camp memento. Photography Interest Group: Focus theme "No Hand of Man"
Photography Interest Group: Focus theme "Collection of Piles"
Photography Interest Group: Focus theme "Summer"
Oil paintings displayed, available for viewing during normal bank business hours. Hampshire County Arts Council artists will be displaying and selling their work (and some will be demonstrating) from 10 to 6 on Saturday and 10 to 4 on Sunday. Free admission. Photography Interest Group: Focus theme "Environmental Portraits"
Award winning photographer Jeff Keister’s work will be on display. All pieces are for sale, and the exhibit contains contact information for the artist. Stop by for a look and a free cup of coffee. Photography Interest Group: Focus theme "Open"
is a Holiday). All photographers are welcome. First Thursday of each month. 4:30PM chaired by Charlie Snead 304-298-3039 Open to the Public. Anyone with interest in what the Arts Council is doing is welcome to attend to help plan for future activities. Focus Theme: Fog. Romney, WV 10-11:30AM 2nd Floor Hampshire County Public Library, Info Sandra Patterson 304-496-7345 All photography enthusiasts are welcome to meet to share their work, share pointers, seek advice. March theme: Cold. Musical presentations also encouraged. Sign up at the desk at the Library in advance or at the event. All ages invited. Cookies & punch provided. First Thursday of each month. 4:30PM chaired by Charlie Snead 304-298-3039Open to the Public. Anyone with interest in what the Arts Council is doing is welcome to attend to help plan for future activities. Calling all Artists! The Hampshire County Arts Council (HCAC) is pleased to announce the Spring Fine Arts Show to be held March 5 – March 24 at the Hampshire County Public Library, Romney, West Virginia. Open to all adult artists, the event seeks to recognize the quality and diversity of art being created in West Virginia and the surrounding states. Dot Procter of Bethesda, Maryland will judge the competition. Dot has displayed her work in The Byrne Gallery, Art Galley of Potomac, Glen Echo Park, Edison Gallery and Dover Public Library. Presently her work is displayed at the Bridge St. Gallery in South Dartmouth, MA and the Gallery Wright in Wilmington, VT.
Three cash awards will be presented at the opening reception to be held March 9 from 5:30 - 7:30 pm at the Library; $250 for Best in Show, $125 for 2nd place (the Vincent Melzac Memorial Award), and $75 for 3rd place. Honorable Mention ribbon(s) will be awarded at the discretion of the judge and HCAC. The fee to enter the show is $20 for members of HCAC and $30 for non-members, which will allow the artist to enter up to 3 items. Work should be brought to the library on Saturday March 3, between 10:30 am & 3 pm. All art must be original work created on or after January 1, 2016, and not exceed the size limitations outlined in the Call for Entries Contact Ibi Hinrichs at visualarts@hampshirearts.org or call at 703-655-1767 for more information. Focus Theme: Cold. Romney, WV 10-11:30AM 2nd Floor Hampshire County Public Library, Info Sandra Patterson 304-496-7345 All photography enthusiasts are welcome to meet to share their work, share pointers, seek advice. April theme: STATUES & MONUMENTS. This engaging quartet traces the rich tributaries of Americana – Blues, Bluegrass, and New Orleans juke joint Rhythm & Blues, enduring genres newly electrified with a modern charge. Click for more info about the group. Click here for advance tickets. Focus Theme: Statues & Monuments. Hampshire County Public Library, 315 W. Main St., 2nd Floor, Romney, WV 10-11:30AM, Info Sandra Patterson 304-496-7345 All photography enthusiasts are welcome to meet to share their work, share pointers, seek advice. May theme: Blue Hour. Potluck meal followed by Annual Meeting of Members and live music by Hay Fever. All are welcome to attend. Focus Theme: Blue Hour. Hampshire County Public Library, 315 W. Main St., 2nd Floor, Romney, WV 10-11:30AM, Info Sandra Patterson 304-496-7345 All photography enthusiasts are welcome to meet to share their work, share pointers, seek advice. June theme: Oddities. The Ukulele Club that will meet every Friday, beginning June 8 at 11 am for 1 hour with lessons and practice under the leadership of Jim Morris. The club will be open to youth and adults of all ages and of all levels of experience. There will be ukuleles available for use; those that have their own instruments are asked to bring them. Beginners will soon find that they are becoming proficient enough to play along with more experienced musicians. Before the end of the summer, we look forward to having the ukulele club perform for local events! $5 per session ($35 available for the 9 scheduled Ukulele Club sessions concluding Aug. 10). (Class will not be held Aug. 3 during the Peach Festival.) After Aug. 10, schedules will be determined by club members and instructor to accommodate their schedules. Missy Shockey will show students how to blend and dry brush colors to create their own Beach Scene masterpieces. For students entering 3rd grade in the fall through this year’s high school graduates. Fee $5. Class size limited to 12; advanced registration requested. NEW! 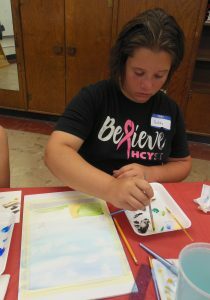 Arts Adventure Workshops for Youth For additional info, call Joanne Snead, 304-298-3039. The Ukulele Club meets every Friday, at 11 am for 1 hour with lessons and practice under the leadership of Jim Morris. The club will be open to youth and adults of all ages and of all levels of experience. There will be ukuleles available for use; those that have their own instruments are asked to bring them. Beginners will soon find that they are becoming proficient enough to play along with more experienced musicians. Before the end of the summer, we look forward to having the ukulele club perform for local events! Missy Shockey will show students how to blend and dry brush colors to create their own Dream Catcher masterpieces. For students entering 3rd grade in the fall through this year’s high school graduates. Fee $5. Class size limited to 12; advanced registration requested. NEW! 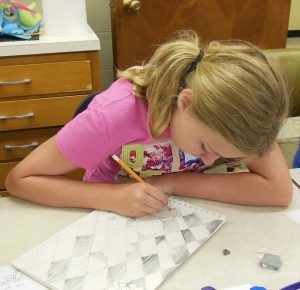 Arts Adventure Workshops for Youth For additional info, call Joanne Snead, 304-298-3039. A beginning Origami class at the Hampshire Co-op,taught by Nancy Judd. Class size limited to 8. For students entering 3rd grade in the fall through this year’s high school graduates. Fee $5. Advanced registration required. For registration and info see NEW! 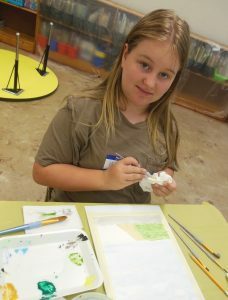 Arts Adventure Workshops for Youth. Registration also available at the Co-op. Learn the basics of watercolor painting with instructor Barbie Hillenbrand. Get past the fear of painting with watercolor and learn the magic ways behind creating great paintings. For students entering 3rd grade in the fall through this year’s high school graduates. Fee $5. Advanced registration required. For registration and info see NEW! Arts Adventure Workshops for Youth. Registration also available at the Co-op. Learn the basics of watercolor painting with instructor Barbie Hillenbrand. Students will learn to take a deeper look at what they see. Is black really black? Is white really white? For students entering 3rd grade in the fall through this year’s high school graduates. Fee $5. Advanced registration required. For registration and info see NEW! Arts Adventure Workshops for Youth. Registration also available at the Co-op. $5 per session (Class will not be held Aug. 3 during the Peach Festival.) After Aug. 10, schedules will be determined by club members and instructor to accommodate their schedules. Artists are invited to bring their own drawing supplies and join fellow artists for a time of sketching and sharing. For information call Robin Pancake, 304-822-5663. What do you see while listening to music? Do you see shapes, patterns, colors or lines? Does the music change your mood? Students in this class led by Judi Gaydos will use those tools to interpret images and feelings they find, through art, while listening to music. For students entering 3rd grade in the fall through this year’s high school graduates. Fee $5. Advanced registration required. For registration and info see NEW! Arts Adventure Workshops for Youth. Registration also available at the Co-op. Architecture, in the United States ranges from simple shelters to technology-inspired super-structures. Some of you may know the history and “who”of these dwellings, but do you know why some of these buildings have the personalities that they do? Why were the materials used and not something else? Why small windows, two floors instead of 4 and are they all so different? In this class taught by Judi Gaydos, students will take a closer look at why these buildings were built and try to answer those questions. This class is open to youth and adults. Fee $5. Advanced registration required. For registration and info see NEW! Arts Adventure Workshops for Youth. Registration also available at the Co-op. Jack O’Hearn, Community Arts Coordinator with the WV Div. of Culture and History, will explain how his organization can assist individual artists, arts organizations, community non-profits, and schools in providing a thriving environment for creative expression and appreciation for the arts. Free and open to all interested persons. Sponsored by the Hampshire County Arts Council. For information call Charlie Snead at 304-298-3039. Hampshire County Arts Council will present The Resonant Rogues, the Asheville, NC-based songwriting soul child of partners Sparrow and Keith J. Smith. With influences that include Appalachian old-time, Balkan folk music, Swing Manouche, and early New Orleans Jazz, they take their favorite flavors and blend them into a delicious, danceable dish. A festival in Hampshire County designed to celebrate and showcase our artists and musicians. Details to come. Hampshire County Arts Council will present returning fiddle player Finn Magill in a new configuration focusing on his Brazilian music. For advance tickets or call 304-856-2440 or email info@hampshirearts.org Tickets available at the door $10 (HCAC members $8), under 17 free. 25th-anniversary celebration to be held at the annual meeting at the Bottling Works. Following dinner at 5 pm and a brief meeting, members and guests will be entertained by the newly formed Hampshire Ukulele Club led by Jim Morris. The public is invited to join Hampshire County Arts Council members and patrons of the arts in celebrating this special recognition of 25 years of service to the community. For information, please call Charlie Snead, President, Hampshire County Arts Council, at 304-298-3039.